Get the successful career you want and the respect you deserve. Complete your application and join the Melton team today! Melton is one of the nation's leading flatbed trucking companies with a large and growing fleet of modern, safe, and well-maintained equipment running the lower 48 US states, Canada, and Mexico. For more than 65 years and with over 5,000 satisfied shippers, Melton has built a reputation of excellence and stability in the trucking industry. As a businessman and over-the-road driver Melton’s Chairman & CEO, Bob Peterson, has a unique perspective regarding what drivers need to make their OTR career and home life successful. 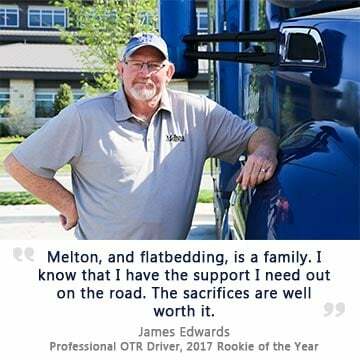 Using his experience as a driver, he tries to provide his team with a stable career and what they deserve by ensuring Melton puts in place some of his favorite amenities as a driver. We are constantly looking for new ways to upgrade our driver’s experience on the road and often survey drivers on what we can improve. We aim to hire the best truckers by offering top pay and benefits, tuition reimbursement programs, guaranteed pay and sign on promotions, free on-site clinics and dentists, 24/7 driver help desk, rider and pet programs, and much more. If you’re interested in the challenge of being a flatbedder but don’t have any experience, no worries! We have invested lots of time and resources to develop the best training team around. Our trainers have extensive OTR and Melton driving experience to deliver the training you need and deserve. If you want to drive for a company that respects their drivers and takes personal interest in their well-being, we think you will find Melton a good fit for you and your family. Please give our recruiting experts a call to talk about what you’re looking for in your next driving position at 888-336-0437. We hope to see you out on the road in a big blue Melton truck soon! Melton is one of the best paying flatbed companies in the country! With our recent pay raise, drivers can make up to an additional $9,000 per year. See how Melton can give you financial security with our new pay package and bonus opportunities. At Melton, we want to reward our hard-working drivers not only with outstanding pay, but with great benefits as well. Get peace of mind with complete medical coverage, our 401(k) with company match, and other outstanding benefits. Great drivers deserve great equipment! Melton Truck Lines operates a large and growing fleet of impeccably maintained, late-model equipment. Experience the most comfortable miles you’ll ever driver with Melton! Melton listened to our drivers and recently changed our home time policy to help ensure you get by the house for those important family functions and appointments. See how you can get miles and quality home time with Melton! Melton Truck Lines offers world class customized paid training to Class A drivers. Flatbed experience is nice, but not required. We will give you all the tools you need to be successful during our paid orientation. Don’t take our word for it! See what drivers have to say about working for Melton Truck Lines and why we’re one of the best companies to drive for.